Today’s mission will test the limits of my Japanese skills, dragging me from the comfort of casual conversation into unknown waters. For today, we are looking for a specific store that has eluded many. The man that runs it, Uehara Yūichi (植原友一), is one of the few students of the late fountain pen maker Uehara Eiichi. Online rumor is that Yūichi*, who still makes all of his pens by hand from Ebonite, is somewhere here in Sendai, at a store called ōhashi dō. 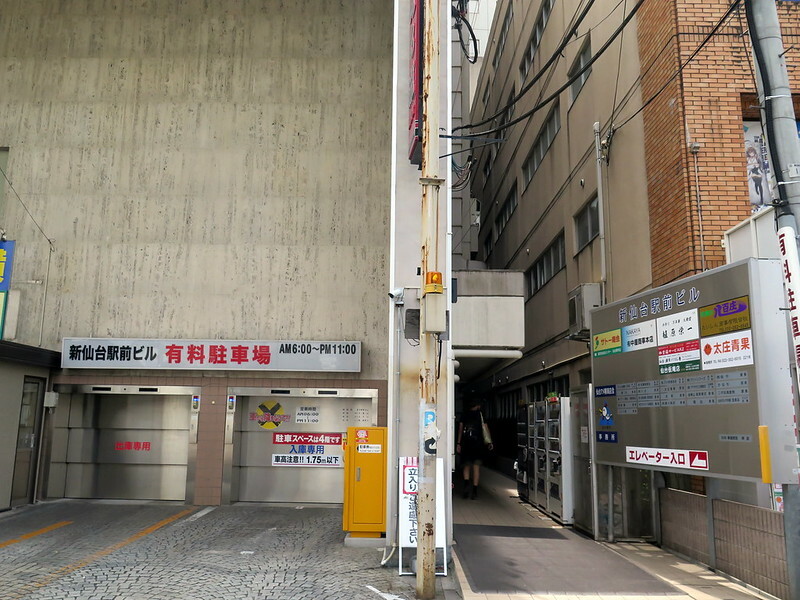 If you ask Google Maps for “ōhashi dō, Sendai” (which is大橋堂, 仙台), it will direct you to 3 Chome-8-5-Chuo, a nondescript gray building just southwest of Sendai Station that houses a fish market. We knew from prior reports online that we would need to do more work if we actually wanted to find Yūichi. We tried the phone number on Google Maps, but got no answer. Hoping that the fountain pen community would know his whereabouts, we continued our search at on the pen floor of Sendai’s Marzuen, where we soon had three employees dutifully trying to help us reach Yūichi. They tried called him (but again got no answer), looked ōhashi dō up online, and eventually printed the Google Maps directions out for us. But the most valuable information they provided was that ōhashi dō as a storefront no longer existed, gone with the late Uehara-san’s death. His apprentices mostly sold pens at pen shows while traveling around the country, meaning that Yūichi may not be in town. Darn. Still, nothing ventured and nothing gained: we walked over to 3 Chome-8-5 Chuo in hopes of finding Yūichi. 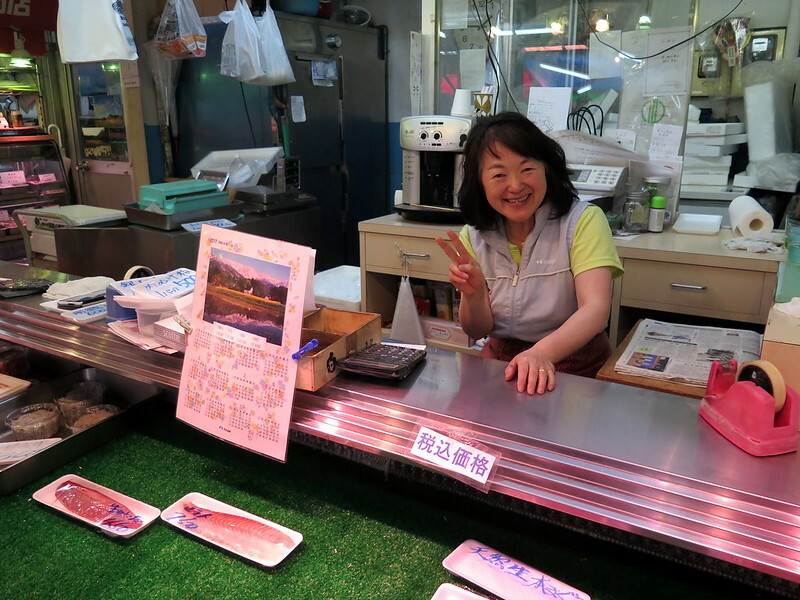 When we arrived the local fish market was bustling with midday shoppers and the lunch crowd. We walked through, hoping to find some sign of fountain pens through the seafood smell, but no luck. 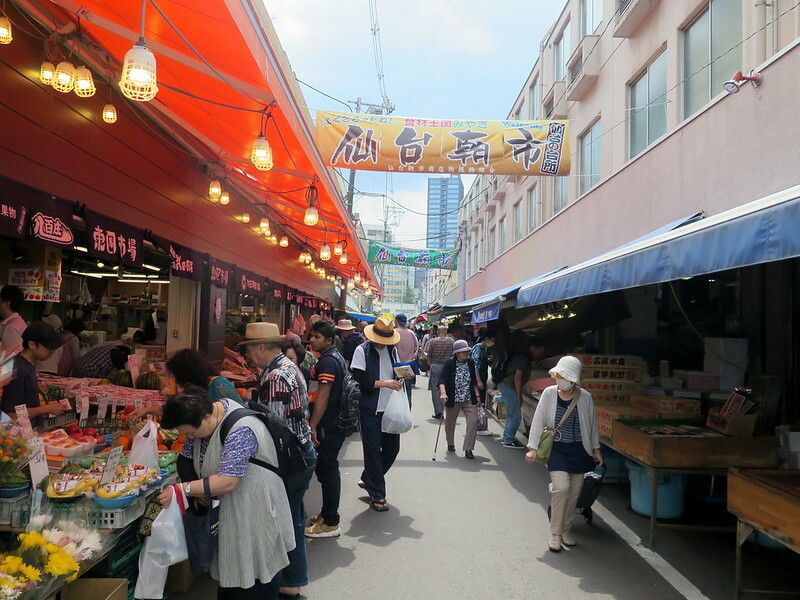 I finally approached the employee of one of the fish stalls and asked “Do you know where Ohashi-Do is?” The woman gave me a smile and said “Well, since you asked so sweetly!” and disappeared for a few seconds. Then she returned and handed me a pair of chopsticks. The employee who handed me a pair of chopsticks, kindly posing for a photo. For those of you who speak Japanese, I hope you’re laughing. For those that don’t, “O-hashi” would be an honorific way to refer to chopsticks, so the fish market employee thought I had asked her *very politely* where I could find some chopsticks. At the time, I was confused for a second, then laughed with embarrassment. “No, no,” I told her. “I’m sorry, I meant ōhashi dō. It’s a store that sells fountain pens.” The market employee began to laugh, too. “Ah, I’m sorry! I thought you asked for chopsticks. I don’t know where the store is, but I can ask.” In minutes she helped us find a guy who knew where Yūichi was, and directed us to a room number three or four floors up. Heading around to the elevator. This looks more like a residential complex than a place for stores. We went around to the back of the building and took the elevator up to what seemed like apartments. In a few minutes we found the right room, with the door ajar. We knocked, and a friendly-looking man appeared at the door. It was Uehara Yūichi! 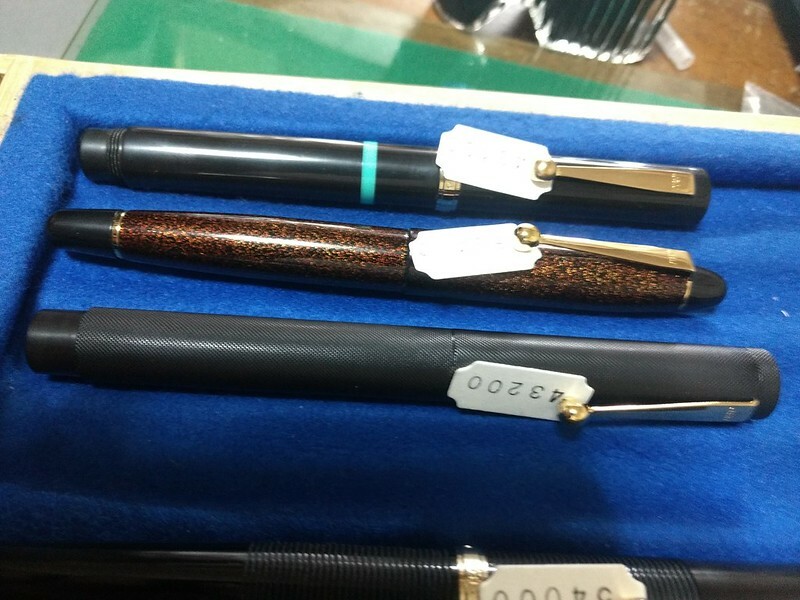 He was indeed in Sendai and happy to show us his current pens for sale, with the usual Japanese-style apologies for the messy state of the workshop. Stoytcho sat down to try them and was in heaven. I, meanwhile, attempted to translate as Yūichi half-described, half-pantomimed the creation process here in his workshop. A bit of a difficult process, given that I didn’t know technical words like nib, slider ring, and lathe. I could hardly keep the word 万年筆 in my head, and cannot thank Yūichi enough for his patience while I stumbled through translating for him and Stoytcho. Stoytcho tries some of Uehara Yūichi’s pens. Pen aficionados talk about the simple and elegant beauty of the handmade ōhashi dō pens, but it’s hard to appreciate their magic until you’ve held one. I know little about pens, but even I can feel the precise art and painstaking labor given to the pen as I hold it. 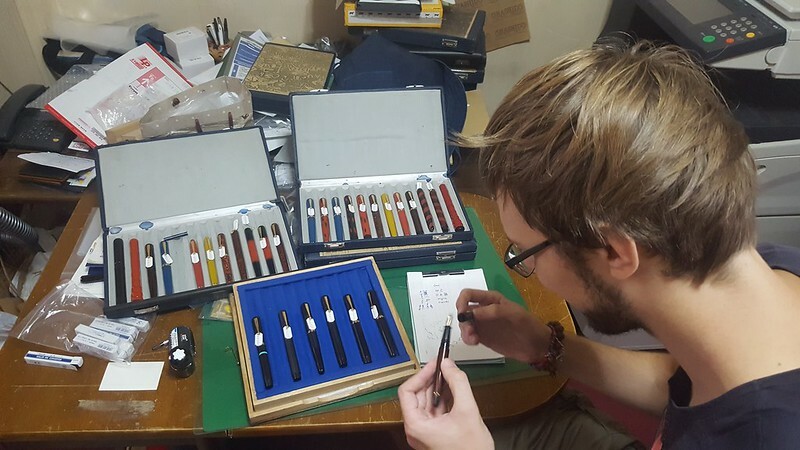 Even though we’ve spent the last two weeks visiting every fountain pen store we’ve found in Japan, where Stoytcho has tried countless Pilots, Pelicans, Sailors, and Mont Blancs, he marveled at the feel of the Ebonite pen body and the flawless fit and finish of each ōhashi dō pen he tried. For those of you that love fountain pens, the ōhashi dō pens aren’t flashy, but they feel like the essence, the Platonic ideal of a fountain pen**, worth feeling at least once in a lifetime. Brush up on your Japanese and find Uehara Yūichi. * I hope Uehara Yūichi can forgive me for using his first name frequently in this post. It’s not common to use first names in Japan unless you’re very close with the person, but is common in English and I didn’t want anyone to confuse him with the late Uehara Eiichi. ** This is Stoytcho’s statement, not mine, which lends it much more credence since this is his obsessive hobby.